Testimonials are great “social proof.” They’re great for giving people some perspective on your business. …are you good to work with? If so, why? …what experiences have others had in working with you? Your goal, ultimately, is to make sure that site visitors feel educated about your services, and that they see you as an expert in your field. 1. Create a testimonials page. Create a page on your website to hi-light your best testimonials and link to that page in your navigation. Here’s a great example from Real Estate Agent, Cyndee Haydon. Or, I love what Real Estate Broker Jay Thompson did to hi-light reviews for Agents in his brokerage: http://www.reviewouragents.com/existing-reviews. 2. Hi-light client testimonials on your home page. People are coming to your website to access local real estate information (search for homes, learn about the community, et cetera). Add some credibility to your site by hi-lighting some of your client testimonials on your home page. For example, I like how Real Estate Agent Maynard Wagner hi-lights his recent client testimonials on his website. 3. Write about your clients (with their permission of course). Recently close escrow with a new first-time home buyer? Why not write a blog post with a picture of you handing them the keys. Have them write a guest post about what it was like buying a home for the first time. Or here’s an example from Stager Michelle Minch who wrote about a successful home-staging – the house sold within a week of staging with multiple offers. The buyer was so pleased he contacted her to stage the property he was moving out of. This is an excellent example of promoting your business without being pushy (you’re simply hi-lighting your work and your client’s happiness with your service). Never fake it! Don’t ever make up testimonials. They’ll sound disingenuous and they’ll ultimately hurt your credibility. Make sure they’re specific. In other words, make sure they explain the benefits of working with you. What made your service unique? How, specifically, were you able to address your client’s needs? The more information, the better. Use your client’s full name whenever possible. And if they’re ok with it, even add a picture. Why? The more information you include, the more genuine the testimonials sound. What would you add? 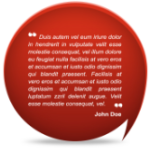 Do you currently display client testimonials on your website? If so, how?